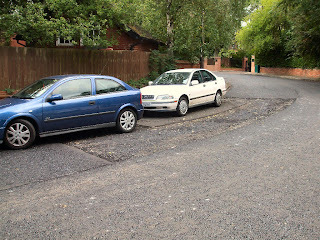 Residents who waited 26 years for their street to be resurfaced were astonished when the council left it looking like this. The work was undertaken on Adderstone Crescent, Jesmond, Newcastle, and cars were moved off the street so tarmac could be put down. 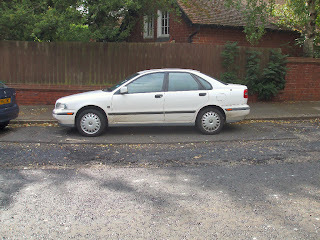 But a white Volvo was left, and council workers left it on an island of old road covering. Taken from the Evening Chronicle. Read the rest of the story here Jesmond resurfacing work is left half finished. I used to live in the house shown behind the white Volvo in these photos (you can just see the garage). It is called "The North Cottage" and it is No.14 Adderstone Crescent". I lived there as a child, with my parents. My fathers 1965 Diary notes . 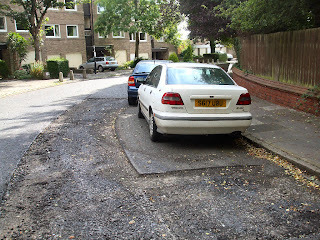 . . "Crescent re-surfaced with black asphalt and chippings" "The previous RED road surface, a big miss". So, the Evening Chronicle article in 2009 states (a resident saying) "we have waited 26 years to get this road re-surfaced". That takes you back to 1983. So, that is probably the next time after 1965 that Adderstone crescent was re-surfaced . . . now there is a bit of a useful (?) history timeline for you! Quite a few roads in Newcastle used to have a nice RED road surface. The most famous being the 'Great North Road' stretch, through the Town Moor. It is a pity Newcastle lost all its "Red Roads"! I reckon it may be time to pay another visit to see if it has been fixed up. I'd forgotten about the number of red roads we used to have!